The Regional Housing Study and Needs Assessment is the first step in the strategic planning process for the Regional Housing Partnership of the Thomas Jefferson Planning District Commission. The analysis distinguishes between the urban area, which includes the City of Charlottesville and the Development Areas of Albemarle County designated for growth, and the rural area, which includes the rest of Albemarle County an all of Fluvanna, Greene, Louisa, and Nelson counties. This regional housing analysis will inform the second phase of the process, which is to recommend housing strategies for each county and for the region that will address key issues impacting housing affordability. Think about color contrast. If you have stairs, place reflective tape at the edge of steps so you can see where each one ends. Use a brightly colored bath mat so you can see where you’ll be stepping down after bathing. Make a decision about your throw rug, which can present a trip hazard. Secure the rug to the floor with double side- tape, throw it out, or hang it on the wall as a tapestry, Ms Eichner suggests. Complex: A major kitchen overhaul could include lowering counters and installing sinks that have space underneath to accommodate wheelchairs and walkers. Alternatively, if you are tall and have back problems, consider increasing the counter height. Install shelves that slide out. Other: Useful guides include the city’s Aging in Place Guide for Building Owners report and AARP’s online HomeFit Guide. Charlottesville’s taxable property values rose more than $500 million last year as nearly all residential properties in the city increased in value under the latest annual reassessment. The city announced Tuesday that Charlottesville’s 15,053 taxable properties saw an average increase of 7.9 percent in 2018. City Assessor Jeff Davis said the city’s total taxable value is $7.67 billion, up from $7.1 billion in 2017. Residential properties increased by an average of 8.1 percent and commercial properties increased by an average of 3.8 percent. About 90 percent of residential properties increased in value while about 4 percent declined and about 6 percent didn’t change. No single part of the city stood out in the reassessment, Davis said. The owner of a $300,000 home would see their real estate tax payment increase $230.85 to $3,080.85. The levy is billed over two payments a year and the rate is 95 cents per $100 of assessed value. Unless the City Council decreases the property tax rate, it will result in an effective tax increase, which requires a public hearing and council vote. Earlier this month, city staff told the council that Charlottesville is expecting a roughly $5 million increase in property tax revenue. Davis wasn’t sure what the rate would need to be for tax bills to remain the same. According to the Charlottesville Area Association of Realtors, home sales increased 7 percent in 2018 over the prior year. The median sales price rose 11 percent and the median days on the market dropped five days. Residential properties have increased in value through reassessments each year since 2014, with the largest increases occurring in 2017 and 2018. The owner of a home valued at $300,000 in 2013 has seen their property value rise by more than $70,000 with the yearly reassessment, contributing to a $667 increase in real estate tax payments. The tax rate has remained the same through that time period. Nolan Stout is a reporter for The Daily Progress. Contact him at (434) 978-7274, nstout@dailyprogress.com, or @nstoutDP on Twitter. Virginia is one of the best places if you want to go solar – but only if you’re rich enough. Due to the steep upfront costs of around $32,000 in cash, only those upper-income families can afford to install solar arrays. Power Home is, however, looking to change that. This new project hopes to help middle class communities see the sun in a different light. The cost for the installation to the middle class families is little to $0 down. The homeowner gets solar panels on their roof and a new reduced electric rate. If interested you can sign up below. Power Home Solar predicts that it could save individual families up to $2,400 a year, which they hope could then be spent on other essential bills. Power Home Solar is excited to be promoting one of the first dedicated solar repayment systems for middle class families allowing them to get a low solar bill and an even lower electric bill. The goal is to install solar arrays to over 32,000 homes by the end of next year. By using training programs, various federal and state incentives, money from companies and private investors, they aim to keep the costs to those who provide and install the panels as low as possible. Home Energy Guide has teamed up with Power Home Solar to install the panels in Virginia. Through covering 30% of the costs with available Government Rebates & Incentives, along with funding from private investors to eliminate upfront costs, Power Home aims to kill two birds with one stone – saving Middle-Class families money, while also making big fossil fuel polluting companies help to cut energy emissions in the state even further. Home Energy Guide invites everyone to find out if they qualify by signing up for a free visit from Power Home Solar. To increase the ease of setting up an appointment to find out if you’re in the middle-class and qualified, they specifically created the form below. They hope that the funding put towards this new system will be well spent, if they can get interested homeowners reaching out to them, they estimate that they’ll be able hit their goal of 32,000 homes by the end of the year 2019. We’ve been notified that panels are still available for homes, you can sign up for a visit to see if you qualify by filling out the form below. Find Out If You Qualify For Solar Funding! By clicking above, you authorize Power Home Solar to call you and send you pre-recorded messages and text messages at the number you entered above, using an autodialer, with offers about their products or services, even if your phone number is on any national or state "Do Not Call" list. Message and data rates may apply. Your consent here is not based on a condition of purchase. About 40% of U.S. adults make New Year’s resolutions and a popular one is to spend less and save more. These simple energy resolutions can help make a dent in your energy bill and best of all these actions are largely one time actions. With about half of New Year’s resolutions abandoned by June, these quick fixes keep on reaping savings and environmental benefits all year long. Capitalize on your New Year’s resolve and start saving today! This one really is as easy as changing a light bulb. Incandescent bulbs are being phased out in the U.S. but there’s no reason to wait for your incandescents to burn out unless you want to continue to waste energy and money. LED bulbs use up to 80% less energy than incandescents and last an average of twenty times longer. Additionally, the cost of LEDs has come down and the quality has gone up, with ‘warm white’ and ‘soft white’ varieties, in the last few years. Programmable digital thermostats have become the norm, replacing old fashioned and highly inefficient manual thermostats. But you have to program it! They have pre-programmed settings to regulate your home’s temperature in both summer and winter when you are home, asleep, or away. If you need to adjust the pre-programmed settings to fit your schedule, try the Department of Energy’s recommendation of 68° when home and 56° when away or asleep in the winter. In the summer, set your air conditioning to 78° when home and 85° when away. Smart thermostats, like the Nest or EcoBee, allow remote control and learn your behavior over time and adjust temperatures accordingly. Studies show that smart thermostats can increase energy savings by 10-20% over more traditional programmable ones. Energy vampires are are plugged-in devices and appliances that draw electricity even when they are not in use. Computers, smart TVs, game consoles, CD and DVD players, and appliances with clocks can all be vampires. Unplugging vampires when not in use and plugging them back in when you need them can get tiresome quickly. Try smart plugs that can be accessed from your smartphone to turn off the device. For entertainment centers or computer stations, consider a smart powerstrip. These powerstrips have outlets that always have power and other controlling outlets that will automatically cut power to the neighboring outlets when the electrical device (e.g., TV) goes in standby mode or is turned off. The EPA estimates 3 to 4 percent of national electricity consumption, equivalent to approximately 56 billion kilowatts (kW), or $4 billion, is used in providing drinking water and wastewater services each year. Saving water, saves energy and money. Taking shorter showers and turning off the faucet after getting your toothbrush wet are the classic advice and great behavioral changes to make. Installing faucet aerators and low flow showerheads and eliminating leaky toilets and faucets can save thousands more gallons a year. 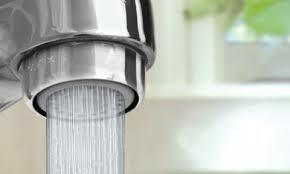 Aerators and low flow showerheads are simple DIY installs and many municipalities offer free water conservation kits. Again, these are one time actions that continue to save on daily basis. As cozy as they are, fireplaces typically remove more heat from a house than they contribute, sending up to eight percent of heat pump or furnace-warmed air up and out the chimney. To minimize this energy loss, make sure your damper is in good working order. Even when a fireplace damper is in good repair and closed, the sealing is not complete. Installing glass doors to the front of the fireplace or adding magnetic fireplace blankets will further cut leaks. If you are not ready to replace a damaged damper, a chimney balloon is a less expensive option. It is an inflatable plastic balloon that seals your chimney like a throat damper. It can be used in almost any fireplace and is inflated and deflated by mouth or with a low pressure pump. This one is more a state of mind than a single action, but can go a long way in keeping you in tune with how your house uses energy and how much. If you don’t know where your home’s energy vulnerabilities and excesses are, it’s hard to take action to mitigate them. Take stock of your home’s energy use with a DIY energy assessment like this one from Virginia Energy Sense. Or you may choose to get a professional assessment like LEAP’s $45 Home Energy Check-Upavailable in Charlottesville and Albemarle. Best wishes for a happy, healthy, more energy efficient 2019! Looking for the VHDA loan that’s right for you? VHDA offers a variety of affordable home mortgages. All are 30-year fixed rate loans. Some don’t require any downpayment; some allow for lower credit scores; and some offer an MCC to help reduce federal taxes. VHDA makes homeownership affordable through our "VHDA Loan Combo," a down payment grant, plus an MCC (a federal tax credit for homebuyers), plus our free homebuyers class. All loans have maximum income and sales price limits and/or loan limits, which vary according to where the home is located. Download our Home Loan Options eBook for a quick overview of all our mortgages, grants and programs for homebuyers! Just click any tab on the side to get started. Eligible for VHDA's Plus Second Mortgage. Eligible for VHDA's Down Payment Assistance grant (DPA). Driverless Shuttle Coming to Crozet! When Do First-time Buyers Buy? Mortgage Interest Deduction Still Stands! Why Aren't Mortgage Applications Higher? Best Boomer Towns -See Why Cville Rates! Charlottesville Voted #1 College Town! Re-Do the Fridge Before the Holidays! Check Out Your Old or New Home! Kiplinger Cites Charlottesville as #1 City to Retire! VA Rebate for Energy Efficiency Available Again - Act Now! MM & Co Leads the Way! Obama Just Signed Extension & Expansion of Homembuyer Tax Credit!!! Kiplinger Cites Charlottesville as 4th best US City to Live & as "Renaissance Town"
Cville the 6th best college town! Hello Montague, Miller & Co - Downtown!